At HKKA we offer a 3 day package for the beginner. With this course we teach new riders all the necessary skills, knowledge and experience to kiteboard in a responsible and competent manner. Our aim is to ensure that you are independent as a new kiter so that afterwards you can go away and practice safely. As any experienced kiteboarder understands, accidents can and do occur, but are generally the result of rider inexperience, negligence and lack of kite knowledge. We feel that this course offers the required time needed to achieve the goal of independence. We also understand that each student varies in their learning style ability and experience. Thus, our instructors are trained to adapt lesson plans to suit the student/s levels. 3-day Complete Beginner: Using the latest IKO teaching methods, we place a major emphasis on learning to safely rig / land / launch / fly a 4-Line inflatable kite. We want flying an inflatable kite to become second nature to you. Learn to fly these kites confidently and safely and the board riding will be easier than you would ever expect. In all our lessons we have kept to theory to a minimum and placed more emphasis on getting out on the beach / in the water and DOING it. 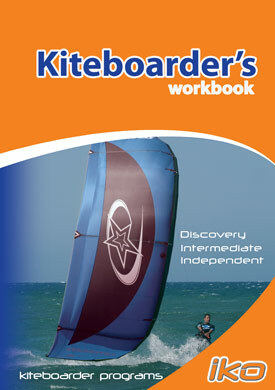 By the end of the 3 days you should have completed IKO kiteboarder Level 1 and Level 2 and be a independant kiteboarder. Day 1 : Rigging up a 4 line kite and equipment safety systems, understanding the wind and weather, site assessment and safety, flying a 4-line kite on short lines, launching, landing, water re-launching, emergency quick release, self landing, equipment types and safety systems.